The main source of food for the Hippo is the short grass. They spend five or more hours grazing every single evening. They may walk up to five miles during that period of time. They can also consume up to 150 pounds of food per day. Feeding takes place as the sun goes down for the Hippo. They remain in the water most of the day to stay cool. Once dusk is setting though they go to land so that they can search for food. They very seldom consume any type of plants that are found in the water, even though they are often accessible. Experts don’t readily understand why they don’t consume them. They will though if they are finding food on land to be scarce. They are mainly sleeping for most of those daylight hours when they are emerged in the water. Since the Hippo is a very large creatures, it is often a mistake that people make about its eating habits. They think that they consume meat and that is how they get so large. However, these animals are herbivores which means they only eat plant life. With their slow movements it would be impossible for them to survive by having to capture other living animals. However, there are reports about cannibalism among Hippos. Should they find that their own survival depends on the consumption of each other they will. This is a way for them to thin out the population. Humans being hunted by Hippos is a myth, but there have been plenty of humans killed by them. It is believed that it is stress that triggers eating meat in Hippos. The possibility is very rare but it is known to happen. It is also believed that some Hippos have nutritional stress where they aren’t able to process what types of foods they need to eat. They are known to consume small animals and carrion though when they can’t get the green vegetation that they need. Many experts believe that the feeding habits of Hippos actually help to transform the landscaping. Where the walk and eat can be changed due to the fact that they eat so close to the ground. This can make it harder for many plants to grow back. The heavy walking patterns of the Hippo while looking for food can also create grooves and patterns that changes the flow of the water from the lakes and rivers. While this takes time to occur it has been documented and it is quite fascinating. You may not be aware of it but Hippos can quickly become dehydrated on land. Even if they are only there after dusk, the climate in the African region can be very dry. 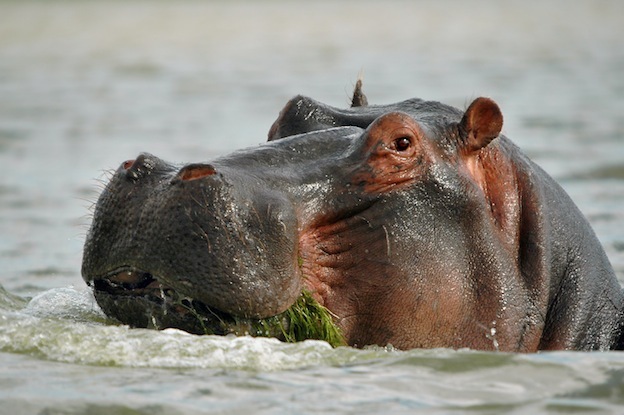 There are concerns that if the Hippo has to stay out of the water for several hours a day to get enough food they can end up with serious health problems. The biggest concerns are for the young offspring. First, they can become dehydrated faster than their mothers. They won’t be getting moisture from the plants as they are still suckling from her body. Second, if the mother isn’t able to find enough food for herself than her body won’t make enough milk for survival of her young. The young will suckle completely for the first six months of life. Then they will start to consume some plants as well. By the time they are a year old they should have the instincts to hunt for food and be weaned.